There are hundreds of extraordinary medicinal plants that are effective at treating many health conditions. Many of these plants are so common that you can even find them in your pantry. The use of medicinal plants is an important part of our history. Modern science continues to show us that medicinal plants have remarkable health benefits. Below is a list of some of the world’s healthiest culinary herbs from their medicinal plants. Cinnamon: Cinnamon is a popular spice found in many recipes including desserts, baked items and drinks. Research indicates that cinnamon has compounds in it that can lower blood sugar levels, making it very effective for those with diabetes or related blood sugar problems. Cinnamon also fights inflammation and has been shown to lower cholesterol, especially the triglycerides in the blood. Thyme: Thymus is a revered medicinal plant that has been around for centuries. It can be noted as one of the great medicinal plants due to its use throughout history for numerous purposes. Thyme is very effective against infections, especially in the respiratory and digestive tract. It can be taken for diarrhea, stomach pain, colic, gastritis, flatulence, bad breath and intestinal parasites. It can also be utilized as an appetite stimulant and to treat bed-wetting. Thyme is one of the well-known herbs for cough, congestion and as a cold remedy. Thyme acts as an expectorant to clear the lungs of mucous as well as an antitussive; to calm coughing spasms making it beneficial in whooping cough and bronchitis. In addition, thyme relieves a sore throat and aches and pains associated with the flu. Sage: Sage is a wonderful smelling and easily grown medicinal plant. Sage is not only a common item in the culinary world, it is also an incredibly valuable plant. It has been used as an antifungal, an aid in digestion, relief from stomach cramps and clear up diarrhea. Sage can dry up phlegm, fight colds, reduce inflammation and swelling and can kill bacteria…an important consideration to remember this time of the year. Peppermint: Peppermint has a long history of medicinal use; for culinary use and being used as aromatherapy. Peppermint is extremely useful in gastrointestinal complaints. Many studies have shown that peppermint oil is useful in relieving stomach cramps, diarrhea, gas and bloating. Peppermint has been used to fight nausea and vomiting during pregnancy or other conditions. Culinary uses of peppermint are used to not only stimulate digestion but to improve taste. Turmeric: Turmeric is a powerful medicinal plant. Countless studies have been done to show the effectiveness of turmeric in the treatment of many different conditions. Turmeric is a yellow spice that can be seen in many curries. It contains several compounds with medicinal properties; the most important is called Curcumin. Curcumin is a remarkably powerful antioxidant, anti-inflammatory, antibacterial, antifungal and fighter against some viruses and cancers. Studies have also shown that it can improve brain function, arthritis, and reduce heart disease. Since inflammation plays a major role in many Western diseases, it is not surprising to see that turmeric is linked to a variety of health benefits. 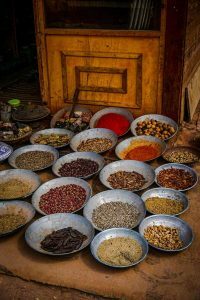 Other medicinal herbs that deserve to be mentioned include ginger, garlic, holy basil, rosemary, cloves, cayenne pepper, pumpkin, onions, cardamom, dill, fennel, lemon, mustard, nutmeg, saffron and sea salt. When you are cooking this holiday season, don’t forget to check out those great tasting and effective medicinal plants in the pantry.